Even though the SummerMusicAcademy marks only a rather brief chapter in the long history of Castle Hundisburg, it is an important one. The medieval Hunoldes castle (first mentioned in 1140) was twice essentially transformed: the first time was before the Thirty Years’ War when a Renaissance castle was built within the old castle’s walls. After 1693 this was expanded into the Baroque castle we know today. The second great change occurred at the beginning of the 18th Century when a spectacular terraced garden was added, to which a 100 hectare park was joined in the 19th Century. A great part of the castle was destroyed in a devastating fire in 1945 after soviet troops were quartered there. Despite several attempts to restore the damaged buildings in the 1960s the entire estate was left to deteriorate. Part of the castle park was even used as a football field. Castle Hundisburg’s was saved in 1991 when its restoration began thanks to civic involvement and financial support from the European Union, the State and the German Foundation for Monument Protection. 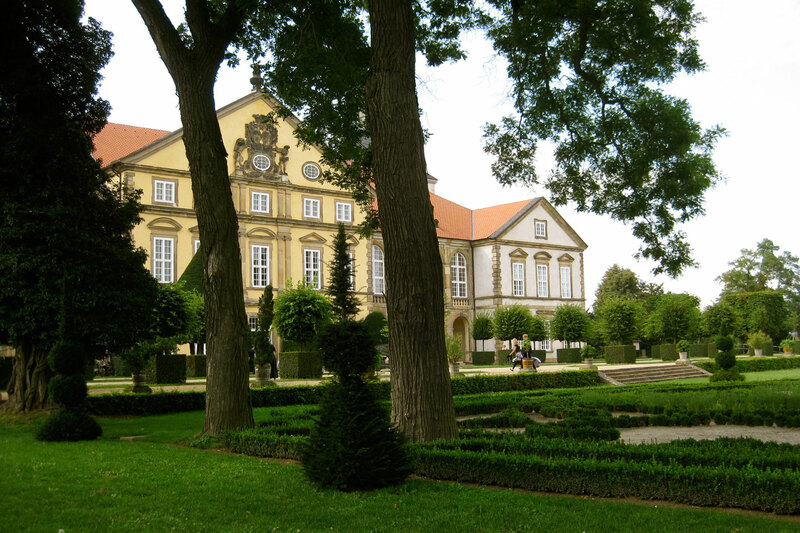 The Baroque garden and adjoining park were also included in the reconstruction efforts. But it was not until the SummerMusicAcademy was brought to life by Rolf-Dieter Arens and the “KULTUR-Landschaft Haldensleben-Hundisburg” society in 1993 that this ongoing construction site was accepted by the greater public — the region’s cultural highlight was born. Since then the castle is gradually being restored, and so more and more of it is becoming available for the SummerMusicAcademy. Doors have been added to the ballroom and the garden hall, the academy and lecture rooms located in the estate’s ring complex have been completed, and the construction of the Paris gate and fountain have added a finishing touch to the Baroque park. So far the restoration of the Baroque stucco ceiling in the Main Hall has without a doubt been the high point of the renovation efforts. It was unveiled for the SMA’s 20th anniversary in 2012. The painter Christoph Wetzel used photographs from the 1930s and color slides from the Führer archive of monumental paintings (“Führerbefehl Monumentalmalerei”) for the restoration. The SummerMusicAcademy, however, has long expanded its reach beyond the castle grounds to a number of special sites and buildings throughout the town of Hundisburg, and which now form an inherent part of the annual summer festivities. Thus the SummerMusicAcademy Castle Hundisburg not only celebrates a passion for high-class Music, but is also a celebration of the sites where it is performed.